Acer Reveals New Range of Android and Windows Smartphones at IFA 2015. Acer announces four new smartphones running on Android, and two more running on Windows 10 Mobile. The Liquid Z630/530 series are designed with sleek, curved chassis with upgraded front-facing cameras, wide-angle lenses and enhanced audio. The new smartphones¹ all include innovations such as the Acer BluelightShield™2 which controls users’ exposure to blue light from the screen and DTS Studio Sound™² gives high-quality audio performance for music and movies. For photo fans, the new models allow adjustment of exposure and focus independently to get clear and bright shots, as well as Bright Magic photo² mode which makes sure a selfie is always presented in the best lighting conditions. All Acer Liquid smartphones announced today share several features that improve the overall enjoyment of the technology in consumers’ hands, whether it’s watching movies, snapping selfies, or listening to music. Innovations such as Acer BluelightShield™ ² which controls users’ exposure of blue light from the screen and DTS Studio Sound™ ² gives high-quality audio performance for music and movies. Phone fans will appreciate exposure control which allows adjustment of exposure and focus independently to get clear and bright shots, and Bright Magic photo that ensures selfies are always presented in the best lighting conditions. Other user features through the range include the Acer QuickMode² user interface which provides three customized layout options designed for specific groups of users – Standard Mode for those familiar with a smartphones; Easy Mode for those who are just learning; and Basic Mode that offers a range of protective options for kids. On top of Basic Mode, these handsets all offer Kids Center, a protected environment with parental control. Helping people get the most out of all these features is the Acer Aid Kit², a set of three tools that monitors the phone’s performance, manage battery life, and run the backup and restore center. Powered by the 64-bit, quad-core 1.3GHz MediaTek MT6735 processor the 5.5-inch Z630 (measuring 156.3 x 77.5 8.9 mm) Android 5.1 handset is ideal for those looking to create, share and enjoy digital content on the go, enabled by 2GB RAM and a standard 16GB of internal memory. It packs a 4000 mAh3 battery ensures lasting performance from every charge. A HD Zero Air Gap screen with IPS technology extends to house the 8MP wide view angle front lens (capable of 1080p video recording) as well as the 8MP auto-focus rear camera (capable of 1080p video). Connectivity comes through its Cat4 LTE, WiFi 802.11 b/g/n, and Bluetooth 4.0 with LE connectivity. The updated Acer Liquid UI is designed to be more consumer friendly than ever before. Key apps have been designed as “Float Apps” taking up only a portion of the screen so users can see and interact with the desktop below. This feature is available for maps, browser, notes, calendar and more, along with “Float Caller” which lets an incoming call pop up as a mini window for the user to choose whether to answer or reply with quick messages without interrupting the current session completely. The Z630 is also equipped with AcerEXTEND which connects wirelessly to a compatible laptop or PC and lets you view the phone’s home screen in a phone-shaped emulator box on the computer. Enabling functions like webpage and document sharing, full screening, drag and drop organization, messaging, typing and simplifies managing files and switching from personal to professional mode using the same device. Acer will also offer the Liquid Z630S model powered by an octa-core processor, 3GB RAM and 32GB ROM. Also powered by the 64-bit, quad-core 1.3GHz MediaTek MT6735 processor, the 5-inch Z530 (measuring 144 x 70.3 x 8.9 mm) Android 5.1 phone is an intelligent device for those serious about their selfies. Focusing on sharp display and quality images and supported by 1GB/2GB RAM and 8GB/16GB storage (depending on market), the Vivid Color display; 84 degree wide-angle front facing 8MP selfie lens; Cat4 LTE, WiFi 802.11 b/g/n, Bluetooth 4.0 EDR connectivity; Acer QuickTouch controls and ergonomic design all contribute to this social media optimized phone. The Android 5.1 handset features a HD IPS screen with Zero Air Gap to ensure bright rendering of color. Photo enhancements presented by Gourmet Mode for food photographers automatically adjusts color temperature and style for pictures of dishes; Touch to capture for focusing and capturing photos with just one touch; Smile Shutter to capture smiles as they happen and much more. Also featuring the Acer Liquid UI, the handset is designed for anyone looking to explore the real benefits of carrying a camera with them wherever they go. 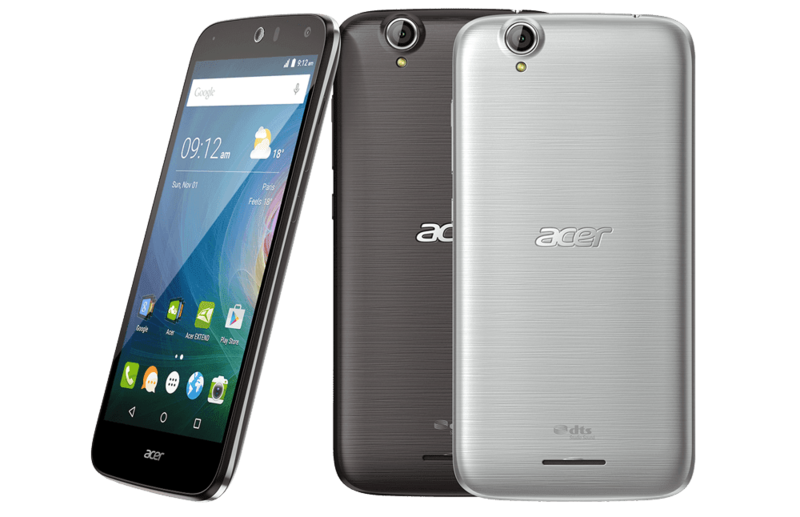 Acer will also offer the Liquid Z530S model powered by an octa-core processor, 3GB RAM and 32GB ROM. As an ideal first phone or an excellent backup to an existing handset, the Qualcomm Snapdragon 210 (MS 8909) processor powered 4.5-inch Z330/M330 (measuring 136 x 66.5 x 9.6 mm) mixes ease of use with quality audio and visual capabilities to introduce its users to just how much fun a smartphone can be without challenging them technologically. Offering 1GB RAM and 8GB storage, the simple, sleek design adds a subtle curve to the chassis, making this phone a pleasure to hold. Designed and built to look and perform the same, the only difference in these handsets is that the M330 runs on Windows 10 Mobile and the Z330 uses the Android 5.1 platform, providing everyone with a choice to suit their needs The FWVGA wide view angle screen complements the 5MP front facing and 5MP rear camera to create great results even for the amateur phone photographer, and the Acer Liquid UI (Android only) simplicity is built in from the start for non-stop enjoyment. Connectivity comes in the form of Cat4 LTE, WiFi 802.11 b/g/n and Bluetooth 4.0 EDR connectivity. The Android based Z330 offers features such as Gourmet mode, Favorite Shot and Bright Magic Selfie and find the perfect settings for the occasion with the Quick Menu for choosing camera modes. The handsets also feature the Acer Liquid UI, making phone use intuitive, and personalization an easy task. As with the Z330/M330, the Z320/M320 is aimed at those looking for a great first smartphone or a feature packed second phone and its OS is identified by the model letter (Z for Android, M for Windows 10 Mobile). Powered by the Qualcomm MSM 8209 processor, the 4.5-inch handset (measuring 136 x 66.5 x 9.6 mm) is a media and rich content friendly device, perfect for introducing a user to social media, sharing and phone photography. It offers 1GB RAM and 8GB storage, a FWVGA wide view angle screen and 2MP front facing and 5MP rear camera. This handset comes with a standard 3G modem, and includes WiFi 802.11 b/g/n and Bluetooth 4.0 EDR connectivity. The Acer Liquid Z630 will be available in EMEA in September with prices starting at €199. The Acer Liquid Z530 will be available in EMEA in October with prices starting at €149. The Acer Liquid Z330 will be available in EMEA in October with prices starting at €129. The Acer Liquid M330 will be available in EMEA later this year with prices starting at €129. 0 comments on "New Acer Liquid Z630/Z530/Z330/M330/Z320/M320 series smartphones unveiled at IFA 2015"